love, ink: First Post of the YEAR! WOW! It's been since October since I posted?! Geez where has the time gone?! Well, we've been moving, guess that's the main reason why! I havent' even touched a stamp since we moved in. Living at the In-laws for a month, and then moving in to our new place on the 10th, and then hosting Christmas Dinner at our place too! It has been busy!! It's like every weekend we're doing something! This is the first weekend we've had a chance to just relax.. and well, we're not really relaxed either! Yesterday i was at RONA, and today, I might go back and pick up some paint to slather around. Or.. the other option would be to organize the stamping space ~ but I'm having such a hard time deciding how to organize it all! So.... I thought I'd start by posting a couple of pics. Please excuse the mess! and GET READY for.... OUR RETRO KITCHEN! When you come up about 5 small steps from the front door, you will turn to your right, and this is the view into our VERY '70s kitchen. Right now, there are open boxes half empty, I have a fold out table that is doubling as a storage bench at the moment, and yes, recycling and bags everywhere. 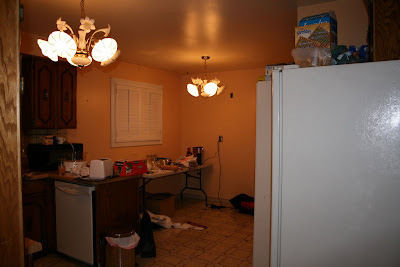 The kitchen, believe it or not, is so incredibly non-functional, it turns me off of cooking completely. It LOOKS like there's alot of space, and there IS.... but its not "Cooking" space. You could do yoga int here...... but entertain a party of 12? Well, doable... but difficult!! I'm still hoping for that winning lotto ticket so that I can demolish it and put in a new one! The view from the other side. 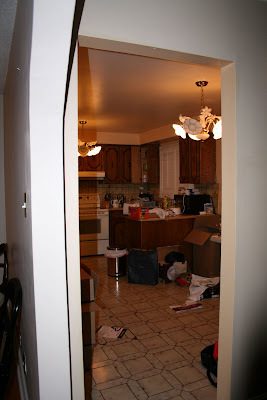 In this photo you can see the fold out table that is currently housing things that don't fit in my cabinets. Which of course, is alot since there is a major lack of cabinet space. See that dishwasher? yeah.. it doesn't work. AND AHEM... in both photos, you probably have noticed those bulbous, tulip ceiling lamps... yes, they are JUST as hideous IRL, as they are in the photo. I sent my mother these photos and she told me she could not stop laughing at them. I mean, they really are hilarious!! Hi Karen! Glad to see you sharing photos of your new home. Well, I have to agree with your mom...those lights do need to be near the top of your list to replace. LOL! I'm sure you'll get the kitchen you want eventually. At least you have the house with more space and that's a good start. Yep! Those lights gotta go!! I have no doubts that when you're finished with this, it will be a showplace! :) In the mean time, I'd go for a crafty space!!! LOL!! Thanks for sharing your pictures, Karen. It's good to see you posting, and I can't wait to see more, whether it be renos, or crafty goodies! I just miss you!! Gotta love getting a new place - let the work begin! congrats though since it's YOUR place and you can do whatever you want with it! Huggles to you sweet friend. I love your kitchen. Thanks for sharing pictures of your new home.